SANYA, China—To provide guests with an unparalleled experience of undersea immersion, China’s new Atlantis Sanya resort deployed an array of cutting-edge HARMAN audio, video, lighting and control systems. 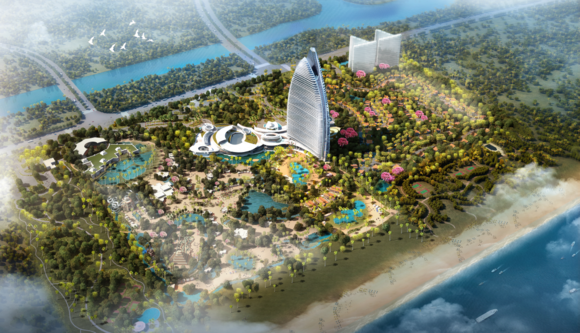 Located in the city of Sanya on China’s Hainan island, Atlantis Sanya is the latest Atlantis-themed resort operated by Kerzner International. The resort’s 52-story luxury hotel boasts over 1,300 guest rooms, including extravagant underwater suites that look out into the resort’s massive Lost Chambers aquarium. The vast Aquaventure waterpark occupies nearly 200,000 square meters and includes waterslides that pass through the aquarium, in addition to snorkeling, scuba diving and live dolphin and sea lion interactions. Other amenities include well-equipped conference rooms and banquet halls for meetings and events, an upscale shopping center and a total of 13 different restaurants and bars. The resort deployed an array of JBL, AKG, Crown, Soundcraft and BSS audio technologies to distribute audio throughout the complex, as well as advanced AMX video systems and Martin lighting fixtures for multimedia integration and striking visuals. Over 1,500 full-range JBL loudspeakers provide total coverage and clarity for background music and announcements throughout the Atlantis Sanya’s restaurants, shops and common spaces. Waterproof, weather-resistant models cover the waterpark and other outdoor areas, delivering the same full-range sound with extra protection from the elements. Many of the hotel’s rooms and suites feature surround-sound entertainment systems with recessed JBL loudspeakers in the walls and ceilings for spacious, immersive sound. The entire integrated audio system is powered by 57 Crown DCi amplifiers, which are connected, zoned and controlled by a digital network of over 100 BSS signal processors, control panels and paging stations. Atlantis Sanya’s meeting spaces, conference rooms and banquet halls are fully equipped with the latest HARMAN audio-visual solutions, ready to facilitate anything from international corporate events to elegant wedding receptions. AKG wireless microphones deliver crystal-clear audio for event speakers, while JBL loudspeakers and Crown amplifiers provide plenty of power without sacrificing intelligibility. Soundcraft digital consoles offer a powerful yet streamlined mixing solution, and dozens of AMX video matrix switchers, presentation systems and touchscreens offer seamless multimedia control. At night, Atlantis Sanya’s contemporary fin-shaped main tower is illuminated with dazzling multicolor lighting displays. 20 Martin Exterior Projection 1000 fixtures project beautiful washes of color, texture and sharp graphics onto the outside of the building.